Are you on the lookout for the best fitness scale to take with you on your journey to fitness and wellness? We agree that finding the right one is critical. Like a good compass, it will tell you if you’re in the right direction. Finding one though that suits your needs is never easy, especially with all the choices out there, from analog to digital to smart bathroom scales. So we’ve narrowed down your options to three in the low-end, smart scale department. 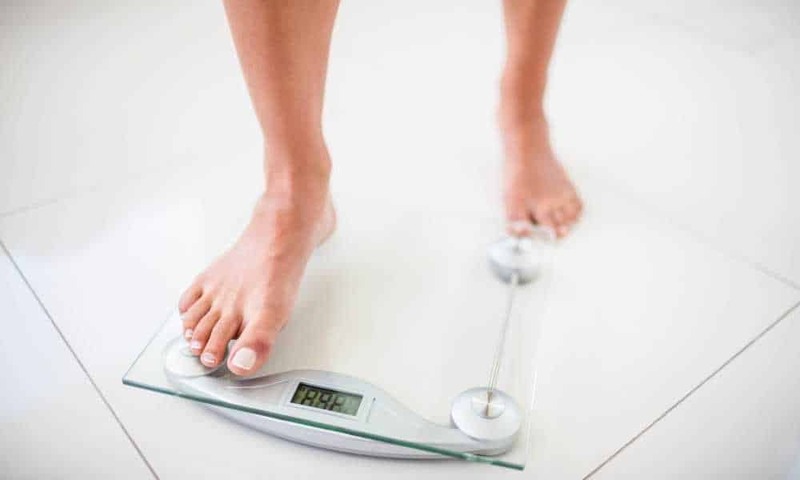 What Are the Metrics Measured by Digital Fitness Scales? Aside from weight, a new generation of bathroom scales can measure other metrics that provide insight into the state of your body. Do you have too much fat? Are you dehydrated? Step on your smart scale, and in no time it will provide answers to your questions. Body Fat Percentage. This refers to the proportion of fat to your total weight. Don’t get us wrong; fat is not necessarily bad. In fact, having too little is not healthy but carrying too much of it, too, will make you susceptible to certain diseases. A body fat percentage calculator is an important feature if you are trying to lose weight. You’d want to make sure the weight loss is due to the burning of fats not the catabolizing of muscles. Visceral Fat. More important than how much fat you have in your body is where they are stored. Visceral fat or fat around the abdominal area is particularly dangerous. This is something you’d want to monitor and is the information made available on certain smart bathroom scales. Muscle Mass. This refers to the predicted weight of your muscles. Development of muscles increases the rate with which you burn calories or energy. In some cases, weight gain can be attributed to the development of muscles. Weight loss, on the other hand, can also be caused by muscle catabolism, which is not good. Bathroom scales that calculate muscle mass will help you monitor this vital information. Bone Mass. This points to the predicted weight of your bone mineral. Drastic changes are not expected from your bone mass; however, a few drops are expected as you age. But, if there is a sudden drop, that’s bad news and should encourage you to get a more reliable assessment from a doctor. Water Weight. 50% to 65% of your body is water, and if you fall below the line, it means you are dehydrated. Perhaps, the miraculous weight loss you see at the moment is just temporary and caused by the water you just sweated out. To get reliable results on this area regarding your weight loss, you have to be well-hydrated. P.S: If you are pregnant or using a pacemaker, it is not advisable to use the body impedance analysis feature of your bathroom scale. While the electrical current passing through your lower limbs to compute certain metrics is weak and imperceptible, it can negatively impact your baby or interfere with your implant device. Some scales though can be safely switched to check only the weight. Make sure yours comes with this feature or just get the analog type to be safe. P.S.S. : With these devices, you may not get actual measurements for some metrics, just estimates. So if you’re not the regular person, the figure may be off from other points of reference such as lab or gym results. In this regard, it’s best to treat the readings not as final figures but just as points of reference of your progress. What Are Some of the Best Fitness Scales in the Market? This pristine smart scale features a tempered glass surface that can hold weights up to 397 pounds. Readings are displayed in large numbers in the pound, kilogram, or stone units. It measures 11.8in x 11.8in x 1in and runs on one AAA battery. Bluetooth connectivity: You can transfer data from the weighing scale to your mobile device. Full app integration: When connected to your mobile device’s Bluetooth, it sends information to the EufyLife app, which is compatible with iOS 8.0+ and Android 4.3+. Automatic recognition: You can save the profile of up to 16 users. Multiple measurements: It provides you with a lot of metrics—12 in total! It measures weight, body fat, water, BMI, BMR, muscle, visceral fat, lean body mass, body fat mass, bone mass, and muscle mass. Smart step-on technology: It turns on and off by itself. The Bluetooth connectivity and EufyLife app make tracking progress very easy. No need to manually copy the results. It also stores 100+ weights, so you don’t need to bring your phone each time you step on the scales. Readings for other metrics can be off for some people since some measurements are estimates based on general population. So if you’re athletic, results can be far from your point of reference. This digital scale is fitted with stainless steel contact plates on the side as well as a clear glass in the middle. It can take on weights up to 397 pounds, showing readings in pounds or kilograms. It measures 14.3in x 14in x 1.6in and is powered by four AAA batteries. Multiple measurements: Other than weight, it also measures body fat percentage, water composition, muscle mass, and bone density. Automatic recognition: It can store readings for up to 8 users. The readings are accurate and consistent. It displays the results in large numbers. They are easy to see. It takes some time to show you the results. The digital scale can get confused if you have two people with the same weight using it, and you’ll have to choose the appropriate profile. 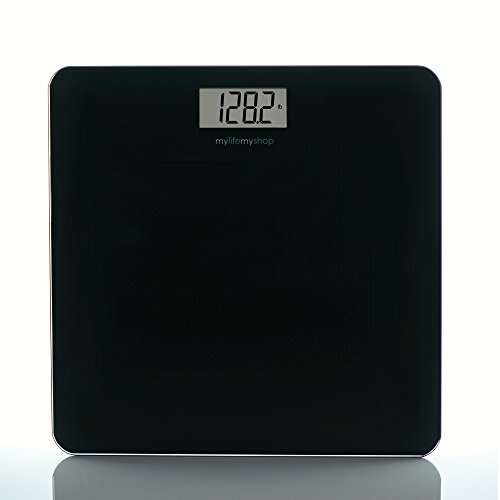 This smart bathroom weight scale is made of high-quality 6mm tempered glass that can carry weights up to 400 pounds. Fitted with four high-precision sensors, it provides accurate readings in pounds, kilograms, or stones. Readings are large and shown in a blue backlight. It comes in black, white, pink, and turquoise color and measures 11in x 11in x 1in and runs on four AAA batteries. Three language support: Users can switch to English, French, or Chinese settings. Multiple measurements: Aside from weight, it also measures water, body fat, calorie, muscle, and bone mass percentages. Automatic recognition: It instantly recognizes who’s on the scale and stores readings for up to 10 users. The digital scale is very responsive. You get the results right away. The results are accurate and consistent. If you get on and off the weighing scale a couple of times, you get the same results. The readings are also the same at the doctor’s office or the gym’s. The backlit numbers are easy to see. The instructions in the middle of the scale are not removable. While the colors of the weighing scale give it a modern and stylish look, the instructions in front are distracting. While it is fitted with an automatic recognition technology, it doesn’t save previous stats. You have to quickly copy them manually since it only repeats the readings once. You need to step on the scale again for it to calculate and fetch you the figures. Although it is easy to get your readings for weight, getting other stats can be difficult. 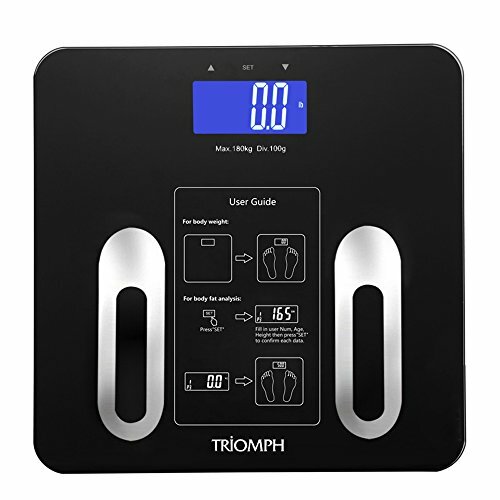 Design: Modern and stylish perfectly fit the Triomph Precision Smart Digital Body Weight Bathroom Scale, industrial for My Life My Shop Digital Scale and Body Analyzer, and immaculate for Eufy BodySense Smart Scale. Aside from the looks, one common laudable point for all three is the large LCD which makes reading your results easy. As for the weight they can support, Triomph, which can carry 400 pounds, is only ahead of the two scales by 3 pounds. They are also all run by batteries—one AAA battery for Eufy and four for Triomph and My Life My Shop. Weight Measurement: In terms of weight measurement, you can clearly see why these three are among the best fitness scales in the market. They give out accurate weight readings; the same as the ones you can get from an expensive scale at a gym or the doctor’s office. Other Metrics: Aside from weight, all three provide other metrics. 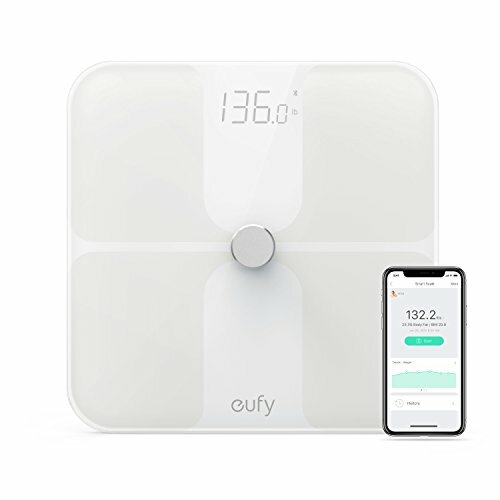 Eufy BodySense smart scale offers a whopping additional 11 data, Triomph’s smart bathroom scale shows five extra figures, and My Life My Shop digital scale displays four more stats. Do you really need all the extra information? That’s something only you can answer. Again, something to put in mind though as you make that decision is that those extra data you get may not be actual measurements but just estimates. Particularly, if you’re on the athletic side, the figures you get for some indexes may be off. You would need a bathroom scale with an athletic mode which none of the three carry. Data Storage Capacity: Among the three, Eufy BodySense smart scale has the biggest user profile storage capacity. It can save data for 16 users. Falling behind are Triomph’s smart bathroom scale at 10 and My Life My Shop’s digital scale and body analyzer at 8. If you have a big household, any of the three will suit your needs unless you need the extra profile storage space. What you should look into though is the convenience with which you can access the data. In this department, Eufy BodySense smart scale still dominates. With Triomph, not only does it not save previous readings, but it also repeats them only once. One good thing going for it is its consistency. So you just have to step on the scale again, to fetch the figures. Still, that can be somewhat annoying. Smart Technology: Of the three, the real intelligent scale is Eufy’s. It eliminates the need to jot down the results in a notebook. With the Bluetooth technology and EufyLife app, you can focus on your fitness journey as it takes care of the record-keeping. You don’t even need to have your phone each time you step on the scale because it can save the data for the meantime and sync it with the EufyLife app when you find the time. Price: Triomph’s bathroom scale comes out cheapest of the three, followed by Eufy, then by the My Life My Shop digital scale. Price though is not any indication of how any of these three performs. Each stands out depending on what criterion you are judging it by. Overall: While all three can easily fit the bill of best fitness scale, Triomph’s digital scale takes the cake in terms of providing quick and accurate results. Compared to Eufy’s bathroom scale, Triomph is primitive. It doesn’t have all the bells and whistles of the former, but it is consistent in displaying weight metrics which is the primary reason for getting a bathroom scale. And it gives you five extra data about your body. At its price point, it’s a good deal. But if you’re the tech-savvy person who is motivated by records and graphs, Eufy’s smart scale will give you that. Its Bluetooth connectivity, EufyLife app, and ample built-in memory storage afford you that convenience. Plus, you get a comprehensive data through the 12 info it can provide—not all of them are actual measurements though. Still, from this scale, you get value for your money. As for the My Life My Shop digital scale, it’s not particularly outstanding in one area, but it doesn’t underperform either. If only it’s the same price range as Triomph’s digital scale or cheaper than Eufy’s, it can be said that it’s a bargain as well.